If you want to very quickly understand why banks stopped lending to one another in 2008, credit markets froze, bank stock prices collapsed, and the Federal Reserve secretly pumped $16 trillion into banks, just take a few moments to study this chart from the Financial Crisis Inquiry Commission of the derivatives casino that Goldman Sachs and the major banks on Wall Street had become in June of 2008. Wall Street banks knew they had created a collapsing house of cards but they didn’t know just how much exposure each bank had or which bank would fail first, so they simply stopped lending to each other, causing a run on the banks. Now, take a deep breath, because we have to tell you that if there was a derivatives graph of every other major Wall Street bank in June of 2008, you would see the same handful of bank counterparties to tens of trillions of dollars more in opaque over-the-counter derivatives. A small handful of Wall Street banks and their global counterparts were on the hook for hundreds of trillions of dollars in derivatives without anywhere near the capital to make good on these casino bets. Now take another deep breath because the tragic truth is that little has materially changed in this situation today — even after the crisis has been studied and examined for a decade; after the massive Dodd-Frank financial reform legislation has been enacted; and after new Federal bodies like the Office of Financial Research and the Financial Stability Oversight Council have been created to prevent another financial crisis. Although Wall Street’s lobbyists and the banks’ global public relations flacks have worked hard at keeping the word “derivatives” out of today’s headlines and out of any historical narrative about what caused the 2008 financial collapse to be as severe as it was, the evidence is clear: opaque over-the-counter derivatives played a major role in what became the worst financial collapse in the U.S. since the Great Depression. But AIG was clearly just a cover story and the tip of the iceberg. Just look at the graph above. 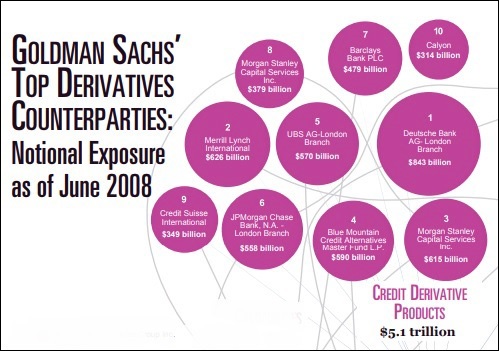 AIG wasn’t even among Goldman Sachs’ top 10 counterparties for credit derivatives. “I must say that despite 30 years in housing, finance, and investment — in both the public and private sectors — I had little appreciation of the tremendous leverage, risk, and speculation that was growing in the dark world of derivatives. Neither, apparently, did the captains of finance nor our leaders in Washington. “The sheer size of the derivatives market is as stunning as its growth. The notional value of over the-counter derivatives grew from $88 trillion in 1999 to $684 trillion in 2008. That’s more than ten times the size of the Gross Domestic Product of all nations. Credit derivatives grew from less than a trillion dollars at the beginning of this decade to a peak of $58 trillion in 2007. These derivatives multiplied throughout our financial markets, unseen and unregulated. As I’ve explored this world, I feel like I have walked into a bank, opened a door, and seen a casino as big as New York, New York. Unlike Claude Rains in Casablanca we should be ‘shocked, shocked’ that gambling is going on. Goldman Sachs was not a national bank or a bank holding company in June of 2008. That meant that, at the time, the Office of the Comptroller of the Currency (OCC), the Federal regulator of national banks, did not have access to its derivatives data. The same is true for Morgan Stanley, whose unit Morgan Stanley Capital Services Inc. is listed twice in the graph above, showing a total credit derivative counterparty exposure to Goldman of $994 billion, that is, just shy of $1 trillion – and yet that information was not on any regulator’s radar screen. There is another interesting aspect to the Goldman Sachs’ graph. 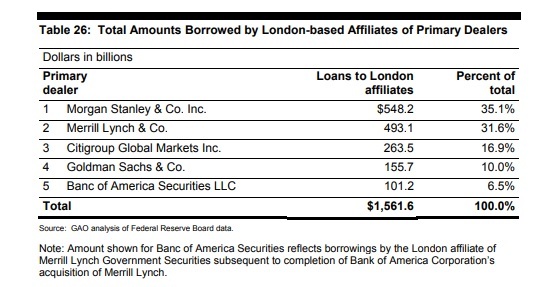 Three of the credit derivative counterparties to Goldman – JPMorgan Chase, UBS, and Deutsche Bank – are using their London branches, thus making transparency that much more difficult for U.S. regulators. We’d like to proffer a likely answer to this mystery – it was because these Wall Street behemoths had dangerous, systemic risk through interconnections of derivatives. 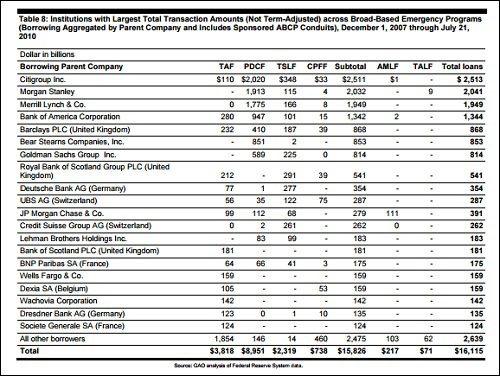 When the OCC published its first quarterly report in 2009 (see Table 2), after both Goldman Sachs and Morgan Stanley had become bank holding companies and Merrill Lynch had been saved through a takeover by Bank of America, every bank listed in the chart above ranked among the top five bank holding companies with the largest exposure to derivatives. Together, just these four banks (with Merrill Lynch now represented under Bank of America) had a combined notional amount of $196 trillion in derivatives, or 67 percent of all 25 banks with the largest derivative exposure. Today, according to the latest report from the OCC, the majority of derivatives are still over-the-counter, despite the mandate in the Dodd-Frank legislation that they be moved to exchanges or central clearinghouses in order to provide transparency to the markets and regulators. Goldman Sachs also has one of the worst rankings in terms of the percentage of its derivatives that are not centrally cleared. According to the latest OCC report, an astonishing 83 percent of its derivatives are not centrally cleared – and yet we do not see any headlines about that. That compares to 58 percent of JPMorgan Chase Bank’s derivatives not being centrally cleared; 57 percent of Citigroup’s Citibank’s not being centrally cleared; and 54 percent of Bank of America NA’s derivatives not being centrally cleared. The bottom line here is that after a decade of various sitting Presidents and Congress and Federal regulators’ reassurances to the public that they have the dangers of the Wall Street casino under control, nothing could be further from the truth. Unfortunately, Congress and regulators don’t respond to a few infrequent peeps from mainstream media. Until we see regular editorials and in-depth investigative reports in both print and broadcast media outlets, the United States is just one casino misstep away from another epic crisis.